Here we are, this month’s practice. For comparison here is last month’s. I think my flourishes are surer and less wobbly. The trouble is that I’ve run out of lessons to imitate, and have resorted, variously, to quotes from Taylor Swift, Robert Louis Stevenson, Miley Cyrus. Oh, and I even included a particularly fun-to-write name of a friend. This month, I even did an entire page of quotes from Nietzsche — that was fun but not as pretty. I can post that too if anyone wants to see. 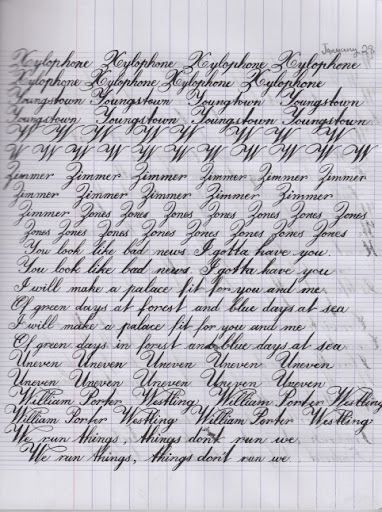 My favorite capital in copperplate is W. N is very nice too, though. I particularly enjoyed “November” and in general find practice to be very zen. I think I write better if I am imitating than if I am just writing something I have no model for (comparing the first line and last 4 lines to everything else). Maybe the point is to eventually have a good model in my head. 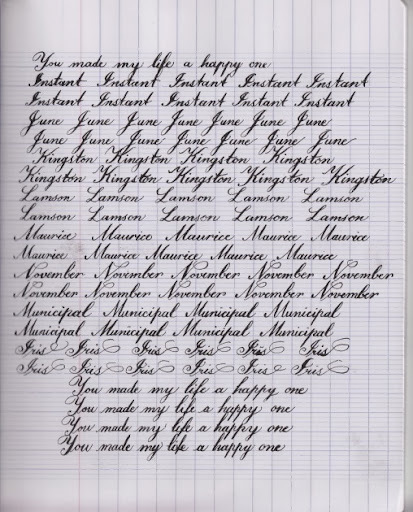 I need to work on spacing and on the letters p and f. Also, my consistency of slant is poor and my flourishes are shaky. Your critique is more than welcome. Please help me improve! Through a friend, I recently learned of the Persian new year, or Nowruz, literally “new day.” It started on March 20 this year, the first day of spring. I asked if one celebrates Nowruz the same as Americans celebrate new years. You know, profligate drunken foolishness, crowding in public to see pyrotechnics and kissing random people at midnight? No, actually, it’s celebrated with a gathering of friends and family to share the moment when spring begins. And little ones receive gifts from older family members. Then it’s followed by 12 days of visiting. I know next to nothing about it, but it seems like a celebration of hope and newness. So this year, I hope for peace. Maybe the U.S. government we can take a little vacation from being the world police, and maybe we can use diplomacy our words instead of threatening and pressuring others. I really hope so. Nowruz sounds like a lovely tradition. I vote for it. In exchange, I’m willing to trade our pesky Christian tradition where the post office doesn’t operate on Sundays.